Friendships offer us room for personal growth, emotional support, and plenty of fun. 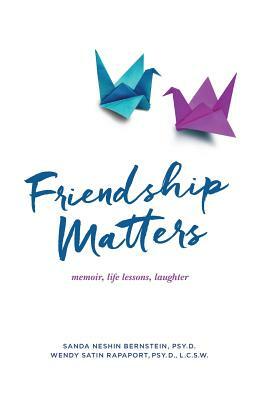 Explore the meaning of friendship in a personal case study of two women who've been friends for years and have worked at having an enriching relationship that helps them through the many challenges of life. Authors Wendy Satin Rapaport and Sanda Neshin Bernstein are both clinical psychologists. In Friendship Matters, they use the example of their own friendship to explore the power of this connection. Friendship takes work, but it should be celebrated for the ways it can improve our lives and help us grow. Close friends are lifelines-the people who help us through the worst days and who cheer us on during the best. We can learn to nurture our friendships most effectively by keeping a few principles in mind. For example, though similarities are naturally comforting, it is also important to respect and celebrate differences because these are rich opportunities to learn. Anchored by a dialogue between these two close friends, this wisdom-filled guide shows us how to have more meaningful relationships. With good friends by our side, anything is possible. Wendy Satin Rapaport, PsyD, LCSW, is a clinical psychologist. She specializes in psychology-related facets of the health-care field, working with providers and patients. She is also an adjunct professor at the Diabetes Research Institute, part of the University of Miami Miller School of Medicine, and at the University of Maine School of Social Work. An interest in behavioral medicine and humor motivates her research, teaching, and writing. This is her fourth book. Sanda Neshin Bernstein, PsyD, is a clinical psychologist who has worked with a number of schools and universities. She is trained in psychotherapy/psychoanalysis and as a school psychologist. She has a private practice in which she sees both adolescents and adults. She has taught in Adelphi University's Postgraduate Program in Psychodynamic School Psychology. This is her first book.